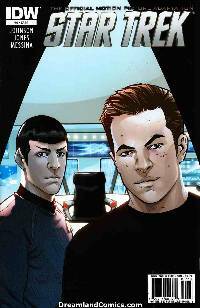 The official comics adaptation of the blockbuster film STAR TREK comes to an epic conclusion in this mini-series presented by J.J. Abrams, Roberto Orci and Alex Kurtzman! Kirk, Spock and the crew of the Enterprise fight to save Earth from Vulcan's fate! Brought to you by the creative team behind the best-selling STAR TREK: COUNTDOWN, this series includes scenes not included in the original film!